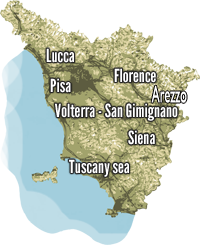 This contract is between DivinaToscana (travel agency licensed by the Province of Pisa Protocol n. 168384) and the client. All bookings must be signed directly by DivinaToscana or agencies officially authorized to act on its behalf and the other single properties. The clients who wish to book the vacation must sign the contract and send it back via fax or email. At the time of booking, the clients must indicate the names of all the people who will be staying in the rented premises. www.divinatoscana.net, of the characteristics of the rented property and the services included. The confirmation of the bookings by DivinaToscana depends on the availability of the properties. The contract is considered final once written confirmation is received from DivinaToscana. Once the payment is received in accordance with the terms described in clause 3), DivinaToscana will send its clients a Voucher indicating the services booked, the instructions on how to reach the house and the address. The Voucher is only valid for the names of those persons whose names are listed. The vacationers must present the Voucher to the owners or their representatives at the time of arrival in order to take possession of the house. Other documents will not be considered valid. The owners and their representatives reserve the right to refuse access to the house to renters if the number of persons is greater than that indicated on the Voucher. If not expressly written in the description of the single property or in the booking voucher, a deposit of 20% of the total amount must be made to DivinaToscana at the moment of booking. The balance of the package price and the services must be paid to DivinaToscana at least 35 days before the day of arrival. For bookings made 40 days before the day of arrival, the balance must be paid in a single payment at the moment of booking. Concerning vehicle rental, the balance must be paid upon taking possession of the vehicle. The balance must be paid directly to the owner or legal representative according to their instructions. The payments must be made to DivinaToscana through bank transfer or credit card. Once the payment is received, the client must send the bank transfer deposit receipt by fax to +39 0588 709008 or email to info@divinatoscana.net, specifying the names of the clients, the booking reference code, and the name of the rented property. For payments greater than 1000 Euro, a credit card will be necessary to guarantee the booking according to the “Terms and Conditions” of the chosen property. The client must send a copy of the credit card bearing the name of the cardholder, card number, and the expiration date. Services not included in the price, such as heating or air conditioning, safety alarm, and any other services not specified in the booking will be paid by the client directly to the owner of the property and/or representative. The services and extras of each single property are indicated on the Website www.divinatoscana.net that the client upon signing the contract must declare to have read and accepted. City tax, which varies from municipality to municipality, it is never included in the price and must be paid upon arrival. Some properties include a mandatory final cleaning among their additional costs. In any event, we ask that you please leave the apartment in order including cleaning the kitchen and taking out the trash. If not expressly written in the description of the single property, the client must check-in between 17:00 and 19:00 on the scheduled day of arrival. The property must be left by 10:00 of the checkout day in order to give the owners enough time to clean the apartment. DivinaToscana is not responsible for disputes that arise between clients and owners related to check-in and checkout times. The safety deposit will be paid to the owner of the property and/or representative at the moment of check-in. DivinaToscana is not responsible for disputes that arise between the clients and owners related to the safety deposit. All of the premises are furnished according to the personal tastes of the owner and are equipped to meet the needs during a short stay. The presence of electrical appliances, such as dishwashers and washing machines or televisions will be specified in the page reserved for each single property. It is rare to find other devices such as toasters, blenders, etc. The coffee machines are usually Italian-style. In the case a payment is not made according to the modalities outlined in clause 3) of the present general conditions, the rental contract will be considered legally terminated without any obligation of communication to the client, and DivinaToscana will keep the deposit as a penalty according to Art. 1382 of the Italian Civil Code. b) if one or more of the basic contractual elements is changed by the organizer after the signing of the same contract, significantly affecting the tourist package proposed, and should the client refuse such a change. - a refund of the payment already made. Such refund must be made within seven working days once a refund request is received. The client must communicate his or her decision (to accept or refuse the changes) within and no later than two working days from the moment in which the communication of the increase or change in plan is received. No communication from the client will be accepted as a tacit agreement to the increase or change. The client who withdraws from the contract before the stay for reasons other than those above must pay the penalty indicated on the property page or in the package. No reimbursements will be made for cancellations received within 14 days before the scheduled check-in day. All complaints concerning deviances in the contract must be directly communicated to the owner of the property and to DivinaToscana during the stay otherwise the claim will be null. If the owner does not resolve the problem by the end of the stay, a written complaint must be sent to DivinaToscana in the form of a letter within the ten days from the checkout date. DivinaToscana will make sure that the owner timely resolves the problem. No reimbursements will be made for stays shortened for personal reasons as well as in the case that incorrect information is provided at the time of booking. If the property confirmed by DivinaToscana at the time of booking is not available for unforeseen reasons, DivinaToscana will be responsible for finding another lodging of equal or greater value. If the client does not accept the alternative proposal, a reimbursement of the deposits made will be made within 7 days, excluding any penalties that apply. Information concerning car rental and other insurance policies related to the Terms and General Conditions of the service providers of the company can be found on the Website www.divanatoscana.net. The information that appears in the pages of the Website DivinaToscana was provided in good faith by the property owners. DivinaToscana is not responsible for any eventual changes made to the properties by the owners unbeknownst to DivinaToscana. DivinaToscana is only an intermediary according to the Italian law. abide by the rules of good conduct so to as not disturb other guests and the owner of the property. The property owners reserve the right to send away clients who are acting inappropriately as well as receive payment for any damages made to the property. The Client is not allowed to use the property for reasons other than those of a private vacation residence for hosting the Client and guests unless otherwise agreed to in a written agreement by the owner. The Client must not carry out any activity that could bother or disturb the owner, the occupants of the adjacent properties, or that goes beyond that covered by the type of insurance policy of that property. DivinaToscana informs its clients that personal data received during any business transactions will be treated according to the laws of D. Lgs. 196/2003. This data can be cancelled or modified at any time by sending an email to info@divinatoscana.net or by sending a letter.